It's the end of June, and that means it is time for our big 12 Kits of Occasions reveal. Our hostess this month was Marybeth, and she put together the most beautiful and elegant kit centered around love--anniversaries, weddings, and just plain love. I had such fun with this kit. I was a bit short on time this month, so I was especially excited to receive the kit with the self-assembling cards. Every month, we each hope to have that kit, and I am happy to say that I have been the recipient more than once. Here is a photo collage Kara created showing the contents of the kit. I was able to make 9 cards before I ran out of time, and I still have lots of left overs. I will get right to the photos, starting with my favorite card. This card cracks me up! Well, that's it for me. I cannot wait to see what everyone else has done with Marybeth's kit. If you would like to see the supplies list for this kit, please click here. I am popping in with a very quick card for this month's PTI Blog Hop. I am out of town this week, but still wanted to participate, so I scheduled this post before I left on my trip. I used a sketch and a color scheme for my inspiration. Thanks for stopping by. I'll be around to visit you when I am back next week. Wasn't last week fun, with all the 100 challenge festivities? I really enjoyed learning all about my fellow DT members, and of course the contests and give aways were fun, too. Now, it's back to business--a new challenge at CASology because it is Tuesday. This week our cue word is WOOD. Lots of ways you could go with this one--I think I could have made 10 cards--using some of my trees or maybe some of those fabulous wood veneer embellishments I have been hoarding. I even have some balsa wood I got at Michaels that works well with my Big Shot. Don't worry, I don't have 10 cards here to show you today. Just one, and it is a scheduled post, as I will be somewhere in New England visiting colleges with my daughter when this post goes live. I incorporated wood into my card in three ways--the stamped images are from Altenew Faux Veneer, I used a wood grain impression plate on my top layer, and I also used a little wood embellishment. Now, it is your turn. What do you think of when you see the word WOOD? 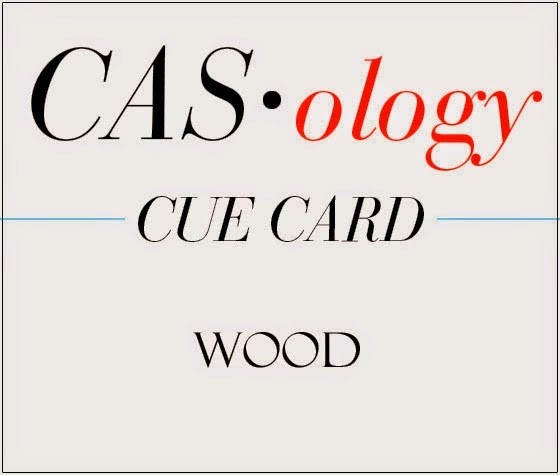 Have some fun with the cue word WOOD, and then please link up your creation on the CASology blog by Monday 6/30 at noon (CST). Check out the beautiful designs from the CASology Design Team members and see how they were inspired by WOOD. Don't forget to keep your card Clean and Simple. I've got an assortment of cards I've managed to make this week, in between getting ready for yet another trip back east with my daughter. My first two cards are inspired by this card by Laura Bassen. I am entering the first one at Simon Says Wednesday You Gotta Have Friends, Simply Create Too Your Sentiment is the Highlight and Simon Says Monday Anything Goes. I used the same stamping technique as I used in this card, where I stamped in black and then overstamped slightly offset in another color. I am entering this next card at Simply Create Too Your Sentiment is the Highlight and Simon Says Monday Anything Goes. I stamped the 'thanks' sentiment repeatedly in Versa Mark ink, and then heat embossed the entire card at once in white. This next card is another card I made out of a failed embossed and water colored background. You can see the first card I made here. There was more salvageable area on this card stock, so I was able to cut two butterflies, with a little bit left over to make a border at the bottom of the card. I will enter this card at Simon Says Monday Anything Goes and Seize the Birthday Anything Goes. My final card is already in the mail to a friend--she has just become a US Citizen. I finally found an opportunity to use my Ranger Antiquities Verdigris embossing powder. I am also entering this card at Simon Says Monday Anything Goes. Congratulations to Lilian YF who is the winner of this Flourishes stamp set. Big thanks to everyone who commented and left me an organizational tip. I have seen quite a few good tips that I will be using in the future. Lilian: Please contact me so I can send you your prize. I am so happy that I am being featured on the CASology blog as part of our 100 challenges celebration. You can head over there to read all about me. Go ahead....I'll wait. But don't forget to come back because I have more to show you here. First up is another card for this week's cue word CELEBRATE. I had an idea for a embossed and water colored background. It did NOT turn out how I imagined it would. What was I thinking, right? Well, I was able to salvage parts of this piece and made something I ended up really liking. There must be a moral to the story....something about making lemonade out of my lemon of card stock. I thought I would use this post to show how I organize all the cards I have made. If you stop by here regularly, you know that I make a lot of cards. I devised a system to organize my cards by theme, which makes it easy to find the cards I need when it is time to send them out. It is also much easier for my friends and family to find what they are looking for when they come by to select cards for themselves. I use bins from The Container store called Frosted Totes to hold all my cards. The bins are stored in a shoe rack I got from Target. The entire set up fits underneath the table where I keep my Big Shot, scoring board and paper cutter. Each bin has a label on the front, indicating what type of cards are stored inside. I actually have two bins for birthday cards. I made dividers using a piece of Michaels card stock and a piece of colored card stock cut with a Half and Half Die and stamped with an appropriate sentiment. Within birthday, I have belated, masculine, juvenile, and general. Most of my bins have cards covering multiple themes. I used a sentiment stamp on the bin's label as well as on the divider. So, for example, this bin has cards that are blank (no sentiment), suitable for a cancer patient, get well, missing you, etc. I like to stamp some sort of handmade by sentiment on the back of each card, and add my initials. To save space, I do not store any envelopes with my cards, unless I have stamped or decorated the envelope, in which case I keep it with its matching card. My bins are not all full yet, and I do have room for one more bin, so I have some room to grow with this system. If you are interested in how I organize some of my other supplies, you can click here to see all my posts on organization. Sometimes I think that I like organizing my supplies almost as much as I like using them. A Give Away It wouldn't be a celebration without a give away, would it? 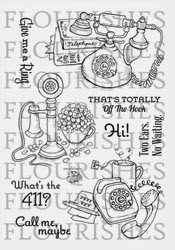 Please leave me a comment with an organizational tip and you will have a chance to win this stamp set from Flourishes. This contest will run until 8AM Central Time on Thursday, 6/19. Edited to add: Congratulations to Lilian YF who is the winner of this Flourishes stamp set. Big thanks to everyone who commented and left me an organizational tip. I have seen quite a few good tips that I will be using in the future. It's Tuesday and that means time for a new challenge at CASology. It is our 100th challenge, and we have been celebrating for the past few days, and will continue celebrating all week. It seems only fitting that our cue word this week should be CELEBRATE. Did you participate in the guessing contest? Did you get it right? I was going for a sort of party on a card look. I used a sentiment from PTI Wet Paint, stamped in black and then offset stamped again in Tropical Teal. I love this look, and was inspired to try it by this card from my friend Sherrie. I stamped a bunch of confetti polka dots on the top of my card using a stamp from PTI Birthday Style in Tropical Teal, Aqua Mist, Berry Sorbet and Summer Sunrise. After I completed all my stamping, I used the Sunshine Impression plate to add a bit of texture. I just love that little extra something that texture adds to a card. Now, it is your turn. What do you think of when you see the word CELEBRATE? Have some fun with the cue word CELEBRATE, and then please link up your creation on the CASology blog by Monday 6/23 at noon (CST). Check out the beautiful designs from the CASology Design Team members and see how they were inspired by CELEBRATE. Stop by my blog tomorrow for a special surprise. I am being featured on the CASology blog as part of our 100 challenge celebration, and I'll have a little blog candy to give away to one lucky commenter. Hi there. 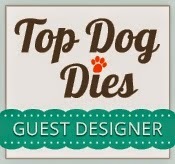 I'm back with my second post as a Guest Designer with Top Dog Dies. Please click here to see my first post. Today I am showing two cards using the Ornate Gate Die. I thought that this die would be perfect for cards related to a new home. For my first card, I paired this die up with a sentiment from PTI Putting Down Roots and some bird die cuts from Memory Box. The sentiment is stamped onto a Simon Says Stamp Sketchy Banner. I just love it when new stamps and dies work with things I already own, and this Ornate Gate Die does just that. For my second card, I paired the Ornate Gate Die with another sentiment from PTI Putting Down Roots that I stamped onto a Stitched Sentiment Flag die cut from Lil Inker. The sentiment is embossed in white and stamped onto PTI Melon Berry card stock. I added a few stamped and die cut plants, also from PTI Putting Down Roots to my little front door scene. Here are the two cards together. 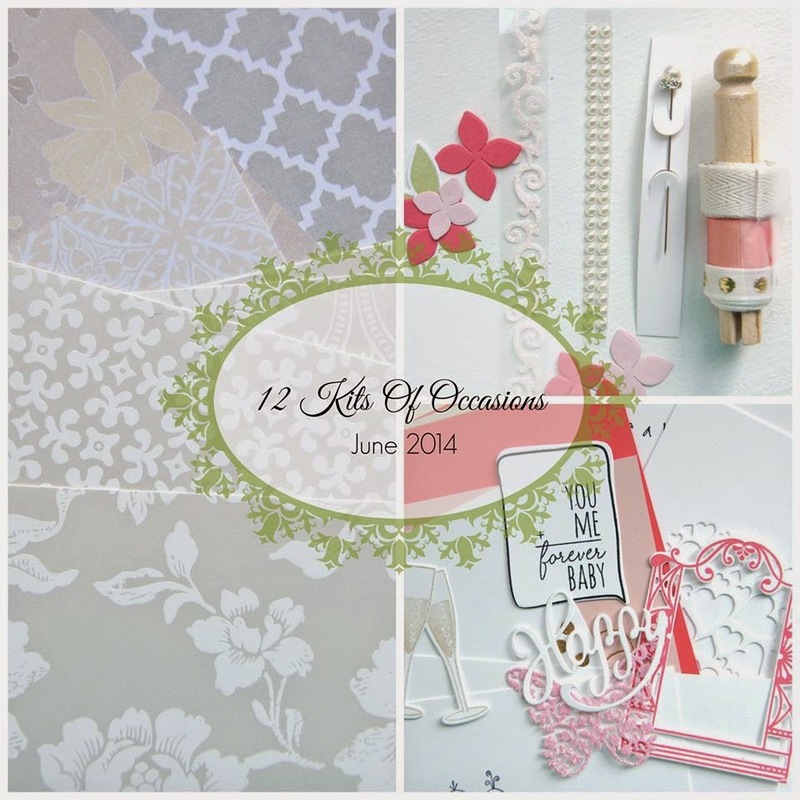 I am entering them both at Addicted to Stamps for their CAS challenge.